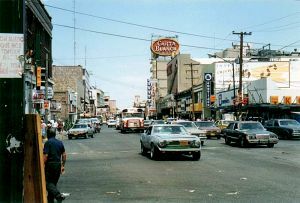 Electrolux will locate in Juarez (pictured), a city of some 1.6 million residents. Mexico's fifth-largest city is located within walking distance of downtown El Paso. CIUDAD JUAREZ, Mexico  The final, jumbo-sized shoe has dropped in Electrolux's big move to Mexico. Coincidentally, Johnson Controls at virtually the same time has divulged that it's also getting ready to make its own substantial southward shift, relocating almost 890 jobs. Electrolux announced that it's chosen a site in Ciudad Juarez for a plant that will replace the 2,700-employee facility that the Swedish appliance giant is closing in Greenville, Mich. The Michigan operation ranks as the world's largest refrigerator plant. Chihuahua Gov. 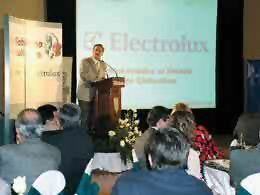 Patricio Martinez addresses the crowd at the Electrolux announcement in Juarez. Similarly, the new south-of-the-border facility near El Paso will be a whopper. The new plant will span 1.5 million sq. ft. (135,000 sq. m.) and will employ 3,000 workers, Electrolux officials said in announcing the project at Juarez's Cibeles Convention Center. It will be the biggest industrial building ever in the Mexican state of Chihuahua, according to officials with the Juarez Chamber of Commerce. Electrolux plans to invest $100 million in what officials described as "the first phase" of the project. Only Ford Motor Co.'s plant in Chihuahua City has recorded a higher investment in the state, Juarez officials said. 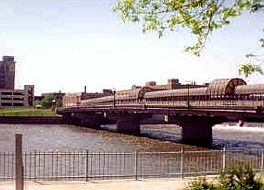 Construction will begin later this year, with production beginning in 2005. The Juarez plant is scheduled to reach full production in 2006. Juarez is a hot spot for maquiladora operations. 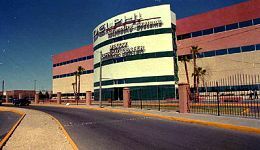 The city is home to more than 300 maquilas employing 220,000 workers, one of them being Delphi Automotive Systems Mexico, pictured above. The Mexican facility will produce top-freezer and side-freezer refrigerators, the company said. At full capacity it will turn out up to 1.2 million units a year. Electrolux's Mexican destination has been the subject of hot speculation since October of last year, when the company first announced that it was considering closing the 37-year-old Greenville plant. "The plant has weak financial performance," Electrolux said in a statement, "and other production sources are being considered, including a move to Mexico." In January, the company confirmed the shutdown, saying that it was moving to a still-to-be-determined Mexican site. At the time, company officials estimated that the new plant would cost some $150 million. In picking Juarez, Electrolux is headed to a city that's already home to one of its much smaller plants, which makes parts for the firm's Eureka brand of vacuum cleaners. The company considered a number of states over a one-year span, according to Patricio Martinez, governor of Chihuahua. Electrolux's site-search team analyzed competing states' labor, infrastructure and logistics strengths, said Martinez. He didn't name any other states that were considered. Juarez is already a hot spot for maquiladora operations. Almost 10 percent of workers in the state are employed in the maquila industry, according to Martinez. In the rest of Mexico, only 0.3 percent of workers are in the maquila sector. The Juarez site will also position Electrolux to take advantage of El Paso's 2,500-acre (1,000-hectare) Foreign Trade Zone (FTZ). FTZs allow authorized areas outside U.S. Customs territory to import goods without import duties or usual Customs procedures. The El Paso operation ranks No. 2 in volume among general-purpose U.S. FTZs. Electrolux has purchased a 500-acre (200-hectare) site in Juarez. The site's sheer size has fueled speculation about whether Electrolux intends to house some of its other operations on the huge tract. By comparison, the Greenville plant's site covered only 35 acres (14 hectares). The Juarez site will also likely be occupied by some of the company's suppliers. Electrolux officials said that the new Mexican plant intended to buy as much as 40 percent of its materials from local-area suppliers. But many of the Greenville plant's suppliers said that they, too, would follow to Mexico if Electrolux relocated there. The Michigan facility is set to shut down this November, when the plant's existing union contracts expire. One supplier, however, definitely won't be making the trip south. Quincy Products recently decided to close its 49-worker plant in Quincy, Mich. The facility had made shelves for Electrolux refrigerators. The company has offered no formal explanation thus far for the abrupt shutdown. Johnson Controls' decision to move 885 jobs to Mexico "was the only option if we were going to remain in the visor business," said Jeff Edwards (pictured), Automotive Systems Group vice president for North America. Johnson Controls' Mexican migration is unrelated to the Electrolux project. Like the appliance-maker's project, though, the decision has major job ramifications. Milwaukee-based Johnson Controls has announced that it will move about 885 jobs over the next 18 months from one of the auto-industry supplier's plants in Holland, Mich., to Mexico. The affected positions are all in manufacturing visors, which are installed in vehicles made by DaimlerChrysler, Ford, General Motors, Honda, Mitsubishi Motors, Nissan and Toyota. The Johnson Controls jobs are headed to one of the company's existing plants in Ramos Arizpe, Mexico. The company already makes visors at that facility, but in limited quantity. The visors made in Ramos Arizpe are only used in Chrysler Group and GM vehicles that are made in Mexico. The rest of the Ramos Arizpe plant manufactures cockpit systems, door paneling and interior-door trim parts that are used in vehicles that are sold throughout North America. What dramatically altered the equation for the Holland plant's visor workers was automakers' demands on suppliers for lower prices, company officials explained. Consolidating visor production in Mexico was the only feasible way to meet those demands, company officials said. "We examined the business case associated with this, and we decided this was the right thing to do in support of the business in total," explained Jeff Edwards, Johnson Controls Automotive Systems Group vice president for North America. "If we were going to remain in the visor business, this was the only option." The additional visors that will be manufactured in Mexico will be shipped back to automakers' U.S. plants, the company said. Johnson Controls, however, will continue to have a strong presence in Michigan, Edwards emphasized. The company has some 9,400 employees in 14 separate operations in the Wolverine State, including manufacturing and technical centers, as well as its global automotive headquarters in Plymouth Township. Five Johnson Controls plants employing some 5,000 workers are located in Holland, a western Michigan town of some 35,000 residents. The plant that will be affected by the jobs shifting to Mexico, however, isn't closing. About 430 employees who make door panels will continue to work at that facility, said Edwards. Michigan officials are discussing coming up with an incentive package to try to convince Johnson Controls to keep its visor production in Holland. The company, however, has already said that subsidies won't change its mind. The economics of moving, it insists, are simply too compelling. The state and the local union tried to avert the Electrolux shutdown by offering a 20-year, $80-million package of incentives. But officials with the appliance giant said that the relocation would save the company $81 million a year. "There isn't a state in the nation that can compete against $1.57 wages [per hour] paid in Mexico," said Gov. Jennifer Granholm (D), who's trying to create new funding tools to promote state business growth. "But what we can compete for are the rights to be home to those 21st-century jobs and businesses that can make a difference." COVINGTON, Ky.  Fast-growing Fortune 500 newcomer Omnicare is more than doubling its work force at its headquarters on the banks of the Ohio River in Covington, Ky. The geriatric pharmaceutical care company has signed a 12-year deal with Cincinnati-based real estate player Corporex to lease an additional 50,185 sq. ft. (4,517 sq. m.) inside the RiverCenter II office tower. Terms of the deal weren't released. Omnicare officials, however, did say that the company will move 240 employees into the newly leased space in RiverCenter II. Omnicare currently has 80 headquarters employees in 42,400 sq. ft. (3,780 sq. m.) of the tower, including space on the 15th and 16th floors, as well as on RiverCenter's penthouse level. Omnicare's rapid growth is the driver in the deal, explained CEO Joel Gemunder. The company has grown by 50 percent over the last two years, he said. 2003's $3.47 billion in revenues, for example, represented a 33.3-percent annual increase. Omnicare has boosted its growth with a ravenous series of acquisitions. Since 1985, the company has bought 85 smaller pharmacy firms. "Omnicare has been experiencing substantial growth over the past several years," said Gemunder. "In order to efficiently support this growth, we find Covington an excellent choice for the consolidation and centralization of various support functions located across the United States." Some of the 240 jobs that will be added in Covington, however, will be newly created jobs, Gemunder added. The company hasn't yet determined the proportion of new-to-transferred jobs, he said. Omnicare has some time to nail down that figure, given the headquarters expansion's phased approach. The company will move into the sixth floor of RiverCenter II by May, then expanding into the seventh floor in June or July, officials said. Omnicare's new space on the 14th floor, however, won't be fully occupied until the end of this year. The expansion and consolidation won't have any impact on Omnicare's 75 other headquarters workers in Northern Kentucky, company officials said. Those employees are based in the Lookout Corporate Center in Ft. Wright, some three miles (five kilometers) southwest of Covington. The expansion in RiverCenter will enable Omnicare to use up to $9.6 million in state tax credits over a 10-year period. The Kentucky Economic Development Finance Authority gave preliminary approval to those incentives back in September of 2003. Authorized through the Kentucky Jobs Development Act, the subsidies provide companies with a one-year window of opportunity to take advantage of the incentives before they expire. The 240 new jobs, though, are 50 percent higher than the total jobs envisioned when the tax credits were approved. The new jobs will pay between $14.42 and $36.06 per hour, according to the incentives proposal that Omnicare presented last year to the Kentucky Economic Development Finance Authority. That proposal also projected that the rent for the expansion space would cost about $1 million per year. Kentucky's incentives provide credits for corporate income taxes that would be spent for rent for additional space and for the costs of an expansion startup. Omnicare's incentives proposal from 2003 estimated that the company's expansion startup expenses would total some $3.2 million. Omnicare's fast-track growth has gotten a substantial boost from the company's rapid-fire acquisitions - which were undoubtedly a factor in the company's decision to consolidate support functions in Covington. Since 1985, Omnicare has completed the acquisitions of more than 85 smaller pharmacy firms. The company's biggest buy, Cleveland-based NCS HealthCare, was completed in January of last year. The $465-million purchase came after a contentious seven-month legal battle that went all the way to the Delaware Supreme Court. Omnicare currently provides drug development services to pharmaceutical, biotechnology and medical device companies in 29 countries. In addition, the company has more than 1 million beds in long-term care facilities in 47 U.S. states and the District of Columbia. The company's ravenous appetite for growth propelled it into 2004's Fortune 500 listing of the largest U.S. companies. Omnicare ranked No. 475 in this year's Fortune hierarchy, which was released last month. The company has been based in Kentucky since 1998, when it relocated from downtown Cincinnati. One of the new floors that Omnicare will occupy in RiverCenter was formerly filled by another company that was lured from the Buckeye State, Gibson Greetings. In 1998, the greeting-card company moved more than 300 employees to the Covington office tower from its existing headquarters in Amberley Village, Ohio. Kentucky facilitated the relocation with 10-year tax credits of $5.3 million. Subsequent events, however, greatly altered the course of that move. American Greetings Corp. acquired 150-year-old Gibson Greetings in 2000 and announced that it would phase out the Northern Kentucky corporate offices, keepint the headquarters in Ohio. RiverCenter is also home to another Fortune 500 player, Ashland, Inc. Centered on chemicals, construction and cars, the company moved to the Covington tower in 1999, relocating from its previous headquarters in Ashland, Ky.
Ferguson Enterprises' new distribution center is the largest industrial project in more than 15 years in Waterloo (pictured), a city of some 70,000 residents 82 miles (131 kilometers) northwest of Iowa City. WATERLOO, Iowa  Industriously working itself to the front of the pipeline, Waterloo, Iowa, has landed Ferguson Enterprises' $21-million, 180-worker distribution center. The largest U.S. wholesale distributor of plumbing supplies will build a 608,800-sq.-ft. (54,792-sq.-m.) facility. That ranks as Waterloo's largest industrial project in more than 15 years, according to city officials. "Waterloo was chosen because it best met our criteria for low-cost Midwest distribution, and because of its business-friendly environment and available work force," said Ferguson CEO Chip Hornsby. Hornsby also cited "the excellent cooperation from the city of Waterloo, the Greater Cedar Valley Alliance and the Iowa Department of Economic Development." Waterloo got the nod for the project "because it best met our criteria for low-cost Midwest distribution, and because of its business-friendly environment and available work force," said Ferguson CEO Chip Hornsby (pictured). Indeed, the Iowa city's success was a testament to cooperation, as well as dogged effort. Waterloo officials courted Ferguson Enterprises for more than a year. Initially, though, the courtship didn't look promising. "We were the dark horse in the beginning," said Mayor Tim Hurley. "We came to the front of the field because of the aggressive effort in selling Waterloo. "This is a happy day. This team behind me helped make it happen," he said, gesturing to the local officials at his side during the project announcement. 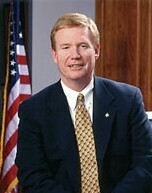 Waterloo rose to the front of the pack "because of the aggressive effort in selling" the city, said Mayor Tim Hurley (pictured). Ferguson Enterprises' site search team focused on potential locations within a 100-mile (160-kilometer) radius of Davenport, Iowa. Seventy-five areas expressed interest in landing the Midwest center. That group was then whittled down to Waterloo and two other sites in Illinois (which company officials didn't name). Waterloo's resourcefulness helped it clear several major hurdles during the final competition. At one point, Ferguson Enterprises shared its worries that the Waterloo area's available work force didn't look large enough to staff the center. The rate of unemployment in Black Hawk County is now at 5 percent. Economic development officials with the Greater Cedar Valley Alliance responded by showing the company a recent study of the area's labor force. What that study detailed was significant underemployment - which meant that many currently employed workers would readily leave their current jobs for a better one. Later, Ferguson Enterprises had a major concern about a Waterloo site that had particularly drawn its interest. The company worried about the costs of developing the 134-acre (54-hectare) site of open farm land. Hurley heard those worries during one of local officials' numerous trips to make their case at Ferguson Enterprises' headquarters in Newport News, Va. The mayor went back home and quickly gathered the local recruiting team. Twenty-four hours later, Hurley called the company back with a solution. Much of that solution is in the local incentive package that the company will receive. Those subsidies include $3.4 million in grants and a 10-year, 50-percent property tax rebate. Part of the city's offer is a $2.4-million grant to Ferguson Enterprises to buy the site. Another $600,000 grant will fund the property's grading. Waterloo also agreed to extend water and sewer lines to the site, as well as instal a rail spur. The city will issue bonds to fund the land and grading grants. And it's going to create a tax increment-financing district around the distribution center site to capture the operation's property taxes. The Waterloo facility will distribute pipes, valves, fittings, and heating and air conditioning products in the Midwest and southern Canada. The city's immediate access to U.S. Highway 20 was a major factor in its favor, since Ferguson Enterprises has strong markets in Milwaukee and Minneapolis. Founded in 1953 as a plumbing-supply operation, the company has expanded into heating and air-conditioning parts, as well as waterworks products, safety equipment and tools. London-based Wolseley, the world's largest distributor of plumbing and heating equipment, bought Ferguson in 1982. In 1998, it combined the company with one of its existing subsidiaries, Familian. The project is the second major distribution operation for the Iowa area. Target last year completed the construction of a $39-million, 1.3 million-sq.-ft. (117,000-sq.-m.) distribution center in Cedar Falls. Local officials, however, rank the Ferguson project as larger because of the size of the site. The plans that the company submitted to the city also include the possibility that the site may be used later for a 400,000-sq.-ft. (36,000-sq.-m.) expansion.